Rubber Room Ramblings: AUTUMN DAYS BIRTHDAY! I borrowed Michelle's Autumn Days stamp set, and I have really been enjoying it. I'm trying to play with it long enough to make myself tired of it so that I don't have to actually break down and purchase this set~~nope, so far that's not working too well. The more I play with it, the more I'm convinced I NEED it. For this card I used some Really Rust patterned paper, Really Rust cardstock, Close to Cocoa cardstock and Very Vanilla cardstock. I "kissed" my stamp by inking it with Close to Cocoa Classic Ink and useing my dauber inked with Really Rust Classic Ink just dabbing a little on the edges. 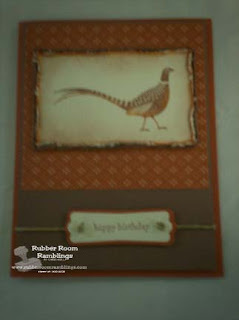 The sentiment is from Teeny Tiny Wishes and is stamped in Really Rust Classic Ink onto Very Vanilla cardstock. Then I used my Stampin' Up! Modern Label Punch to punch out the sentiment. I used my Movers and Shapers die to make the Really Rust piece that I mounted my sentiment onto. I popped up the sentiment with dimensionals and then added some hemp and distressed the edges of my stamped image. It took a little while to make this one, but I love the way it turned out. I think it will be a great masculine birthday card.